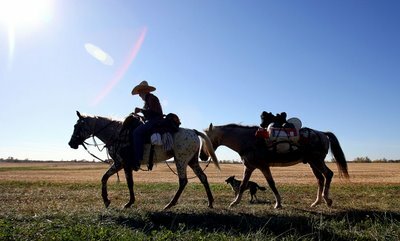 John Wayne Haynes is riding from Michigan to New Mexico on his two Appaloosa horses, Misty and Harley, accompanied by his dog Sheila. He is currently riding south to Tennessee and then west through Oklahoma. The Guild just received this lovely message from an unknown person who met the new Long Rider, John Wayne Haynes. The Guild’s response is below. Never have I been so impressed by a "time traveler" as I am with one of the Guild's latest members, John Wayne Haynes. An accidental meeting in Oklahoma introduced me to John on his expedition from Michigan to New Mexico. A poet and a songwriter, I was invited to meet John at a dinner and as I sang a couple of songs for his enjoyment after dinner and read a poem or two for him, He said "Let me sing you a song". He then proceeded to sing a handful of "cowboy based songs" flawlessly and wonderfully done. The evening formed many fast friendships at the Circle D-5 Ranch in Luther, Oklahoma and extended on to the next day as well with many visitors of family and friends coming to meet John Wayne Haynes. It was a wonderful experience for all concerned and tales of his trip lured us all into the world of the Long Rider's Guild. A second evening was filled with music and friendship of this equestrian traveler and a lifetime of memories was spawned for all participants in this most marvelous of experiences. A gentleman, a wonderful entertainer, a truly marvelous example of what your Guild brings to the equestrian world in one of its finest examples of the wonder of Yesteryear, you should most assuredly use John as one of the finest examples of your Guild. After John departed to continue his expedition, I penned the song "Long Rider". John has heard this latest work to the testament of his ride through Luther, Oklahoma and enjoyed it almost as much as I enjoyed writing it. Upon the completion of his expedition, I hope a favorable review of the song will put it on his page at Long Rider's Guild. Just one who watched this "time traveler" come and go through our little piece of this magnificent world, I thank you for being you Long Riders and join you in your celebration of the cowboy ways of yesteryear. CuChullaine O'Reilly of The Long Riders' Guild here, writing to thank you for sharing such a warm and enthusiastic letter about the newest Member of the Guild, North American Long Rider John Wayne Haynes. As you discovered, John is a truly open-hearted and most sincere individual, one who cares about his horses, is polite to those he meets, and comprehends the deeper meaning of the journey he is on. Yet when John rides, sings and smiles, his message is not that of a "time traveller." For though equestrian travel is indeed mankind's oldest link to the horse, what John, and the other Long Riders like him, represent is humanity's on-going, deep-seated desire to ride our horses towards a distant horizon, not just geographically but emotionally. Such a longing is buried in the DNA of some people, yet as John proves, this is a message that transcends time, geography and nationality. - Preserving the public's trust. - Protecting our comrades from outside assault. - Honour, Loyalty and Trust to each other. In a word, chivalry, whose root word is "cheval," horse. And that's what John is - a true horseman. I'm proud to call him my friend and thankful that it is people like him who represent The Long Riders' Guild. 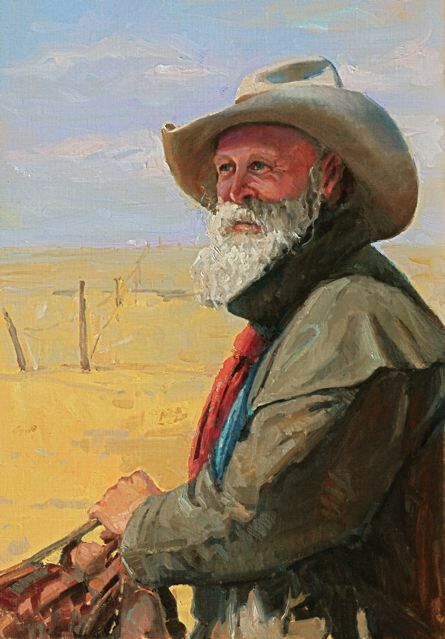 Long Rider John Wayne Haynes, by Dee Beard Dean. Dee Beard Dean has been painting all her life; she studied art at Grand Rapids College, Kendall College of Art and Design, and the New York Academy of Art. Please click here to go to her website, and here to see a portrait of John with his three four-legged friends. John has even inspired a poem! Thanks to PD Palmer Sr., who composed this and sent it to The Guild. WITH A HEAD FULL OF SONG.